What’s on your to-do list of July Gardening Tips? Gardening activities usually slow down in the summertime as the temperature continues to climb into the 90s and beyond. July is often a very dry month and, historically very hot. Hopefully, these helpful tips can help you take some of the heat out of your gardening work. New garden projects are on hold until cooler Fall temps prevail but there are always maintenance chores to do. The best time to do any kind of work in your yard and garden is in the early morning or early evening hours when the sun is less intense. Proper watering is essential to keep plants healthy in the heat of summer. A best practice is to water as deeply and infrequently as possible, as opposed to frequent, shorter watering cycles. This will encourage a deeper root system that can take advantage of water stored in the soil. One of the best strategies for getting shrubs and young trees through summertime dry spells is to apply a thick layer of mulch over the root systems of plants. 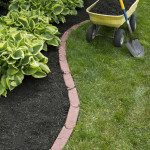 Mulches break down over time, so if it has been awhile since you’ve mulched, check all the plants in your yard. A three to four inch layer will prevent most evaporation from the soil and lower the soil temperature in the root zone, reducing stress on the root system. Drip irrigation combined with mulch is an excellent way to maintain high quality of plant materials. Drip irrigation, also known as trickle irrigation or micro-irrigation, is an irrigation method that saves water and fertilizer by allowing water to drip slowly to the roots of plants, either on the soil surface or directly into the root zone, through a network of valves, pipes, tubing, and emitters. It is done through narrow tubes that deliver water directly to the base of the plant. This allows for fertilizer and nutrient loss to be minimized due to localized application and reduced leaching. Soil erosion and weed growth is lessened with this type of irrigation while keeping foliage dry, thus reducing the risk of disease. If drip irrigation is not an option at this time, consider using soaker hoses to provide a slow, steady source of water to your garden or bedding plants. This entry was posted on Sunday, June 24th, 2018 at 2:45 pm	and is filed under News & Updates. You can follow any responses to this entry through the RSS 2.0 feed. You can skip to the end and leave a response. Pinging is currently not allowed.